When you're there it is hard not to be in awe of the scale of it and you really get a sense for just how far the pet industry has come. With so much to learn and see, and much more than 1 minute and 28 seconds needed to see it, I find it best to put a fair amount of planning into how best to use your time. In order to get the most return on your investment to attend I find it best to map out who and what I want to see, and exactly where I can find it on the show floor. Often I will also list a few back ups just in case the seminar I am in isn't what I expected. That way I can move onto the next thing quickly and not waste any time. Believe it or not this photo captures less than a third of the actual show floor. Next time you find yourself at Global head up to the third floor catwalk and take in this view for yourself. Even with the "divide and conquer" approach our team takes to these shows it is truly impossible to see it all, but we still saw so much and would love to share with you some of our highlights. The New Product Showcase seemed to go on forever this year. I have since learned, that it was approximately 45,000 square feet and was the largest new product showcase at any pet industry trade show in the world. An impressive 15,000 square feet larger than the 2018 show. There is no denying that there is a lot of innovation going on in this industry, and while too much product development can lead to over saturation it also helps the truly brilliant items stand out in the crowd. Since Pet Food Experts is a buyer/distributor we were allowed in an hour early to really get a good look and cast our votes on who we think the new product showcase winners should be. Here are just some of the many new products we loved. Winning 3rd place in the "Natural Pet" category was Icelandic+ for their new cod treats. They also featured some clean new package designs in warm colors which really popped. These 100% natural and edible Icelandic Fish Treats for Dogs are single ingredient and contain no additives, preservatives or supplements. You're probably already familiar with their cod skin treats, well they have now taken it to a new level by pressing those skins into a tightly packed cube. Brilliant! With the new Cod Cubes not only do dogs have a new fun shape to chew on, but the nature of this new shape must improve upon their claim that they reduce tartar and plaque build-up for healthier gums and teeth. Also, fish treats from Iceland are unique because Iceland almost never gets warm, and therefore their fish always remain cold after being caught. As a result, they have less of an odor than other fish treats in the market. Which we know pet parents and store owners alike will appreciate. 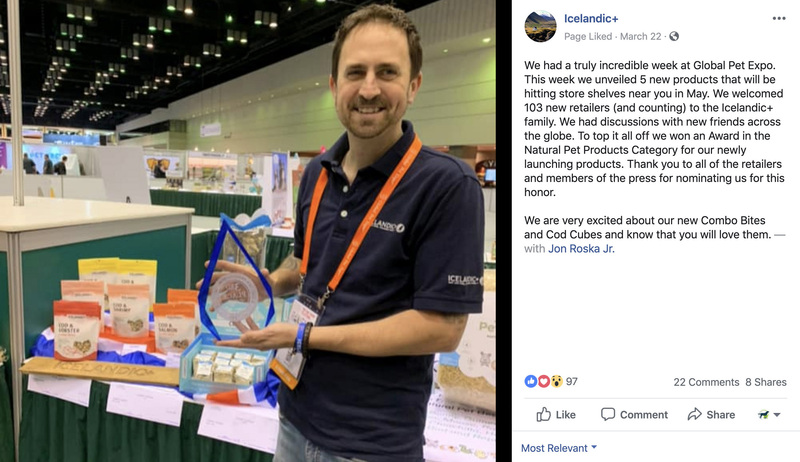 Jon Raska, CEO of Icelandic+ proudly displaying their 3rd place award for best new natural pet product. This year The Bear & The Rat decided to re-imagine goat's milk for pets by offering it as a frozen treat! Released this past August, these ready to eat treats are lightly pasteurized and therefore legal in all 50 states, giving access to goat's milk to retailers who live in states with regulations on raw milk. However, just because they have been through a process which naturally deactivates enzymes and kills both harmful and beneficial bacteria (don't worry, the proteins, minerals, fats, trace elements, electrolytes, lactose, and calcium stay intact) doesn't mean these treats aren't a complete digestive aid for pets. In order to put back in what was lost during this process The Bear & The Rat has partnered with InClover Research and supplemented each cup with their OptaGest formula. This complete, unique blend of prebiotics and plant enzymes supports intestinal balance and a healthy immune system. These sweet little frozen treats also feature quality ingredients such as turmeric, cinnamon and ginger. Yummy! Our friends at The Bear & The Rat also hosted a human & pet ice cream social during the show, and were directly across from InClover Research for any customers who had questions about their new product. One area where there is no shortage of product innovation is in the controversial CBD category. But, in a show full of products promising similar things how do you know the truth from the... well, not truths. Well, first you start with brands you know you can trust, like Earth Animal. Who this year is celebrating 40 years in business, happy birthday! Although they won an award for their new Peanut Butter No-Hide® chews (which smell amazing by the way) today we are going to talk about their new CBD line, Nature’s Comfort™. Beautifully packaged with a whimsical design these products are featured in both a traditional chewable tablet and a transdermal gel pen. This gel which is administered using the companies patented UPTAKE™ Technology is meant to be applied directly on the pet’s inner ear flap where there is the least amount of hair. This allows the CBD compounds to take effect immediately, and enhances the healing properties providing a longer-lasting and quicker form of relief compared to other delivery methods. Earth Animal's booth was also one of the most stunning. From the reclaimed wood, to the signage promising that they give 1% of all sales to preserving and enhancing the quality of life for animals, people, and earth. You can clearly see this is a company that truly cares about sustainability and the quality of products that they offer. 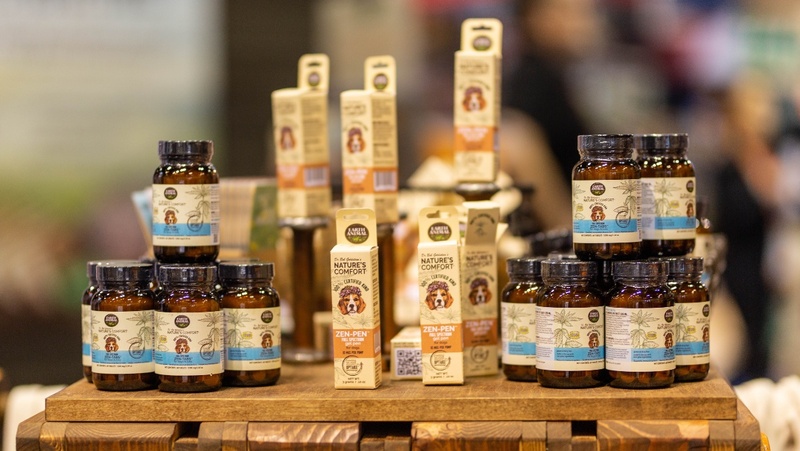 Another company that stands by its sourcing and labeling and has been at the forefront of this trending category is our friends at Super Snouts Hemp Company. 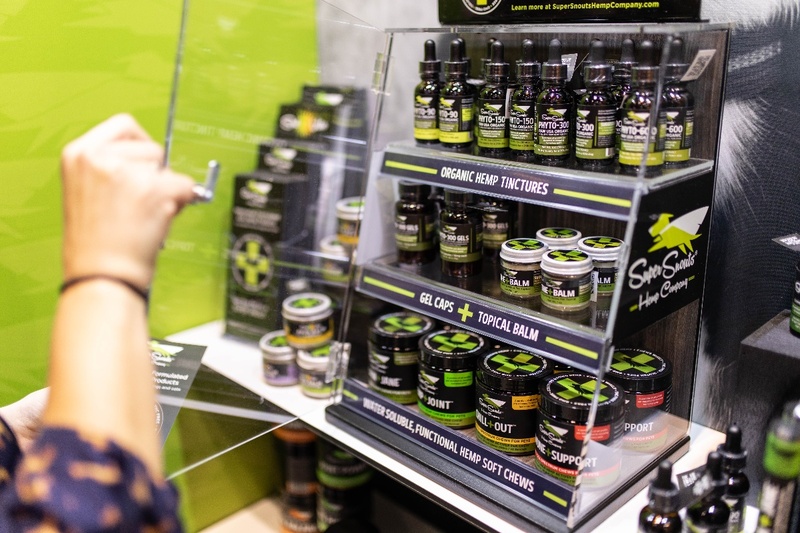 Who this year not only debuted their human CBD line, appropriately named Soul Vibe, but also won second place in the point-of-sale category of the New Product Showcase for their sleek new counter display. Handcrafted in Pet Food Experts home state of Rhode Island and made out of a durable acrylic this display comes adorned with well designed signage and a locking mechanism to help keep products safe from sticky fingers. I can't be the only one that get's excited about a beautiful display? This is the perfect thing to keep these small high dollar items secure while still being easy on the eyes. Every year vendor booths sprinkle the floor in all different shapes, sizes and used materials. There are the larger than life booths such as Blue Buffalo, which are an experience in and of themselves. To interactive booths such as Kurgo or Bixbi which both featured an airstream to hold meetings in. Or Fromm Family Pet Food, which had a full art gallery set up featuring their well-known painted dog and cat portraits hung on the wall with cushy benches in order to sit back, relax and admire. This idea from Fromm Family Pet Food was so smart and very well executed. Loved it! It is always so impressive to see how vendors keep their booth's new and fresh at each show year after year but still manage to hold true to their companies brand. Amazing! A great example of this was Earth Rated Poop Bags, whose straightforward 2-sided multi functional layout was not only simple and beautiful but really showcased the product. With a neon sign that read "Never Stop Wagging", grass accents, an eco friendly feel, and cute little sayings spread throughout. They even had sneakers branded with their logo, all hand painted by a local artist in Montreal, Canada where they are based. Have you ever seen a more beautifully simple poop bag display? I think not. 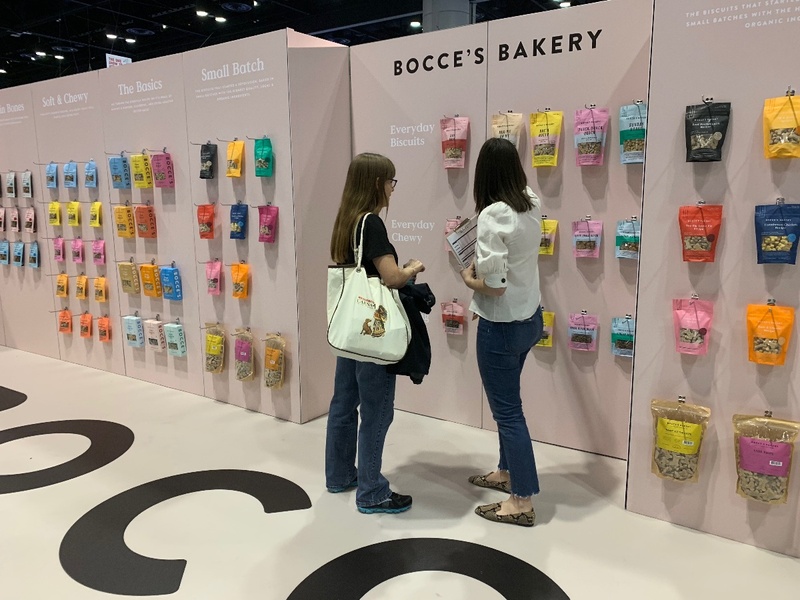 Another favorite was Bocce's Bakery who this year debuted their new branding. The clean and minimal design really gave their booth an "Apple Store" feel and is a true testament to the term "less is more". We stopped and chatted about not only their beautiful booth, but their new packaging and social media in which this new look and feel is carried throughout. As a graphic designer at my core, I am always impressed with design that is simple yet makes a large visual impact. Bocce's new branding is the epitome of that thinking. Bravo! One of my personal favorites from this year was Open Farm. This booth had a great clean design and was easy to flow from one end to the other. With wood walls 20ft high decorated in phrases from the companies overall branding and messaging. 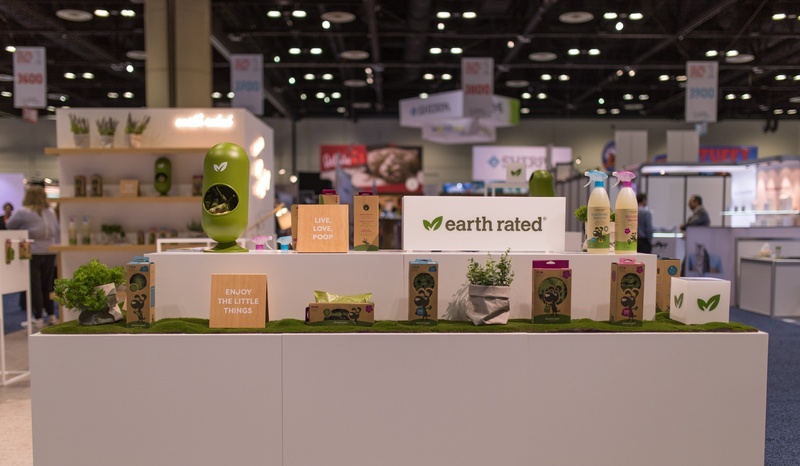 They had the product displayed in a rainbow layout which really caught the eye, and tied it all together by sharing their message of sustainability and how they use better practices to help ensure the future of our great industry. Click and expand the image above to fully immerse yourself in this 360 experience of Open Farm's show booth. Trust me when I say that it doesn't do it justice. Aside from all the product vendors and manufactures there are to chat with at Global there are also other opportunities to learn something new. The best kept secret of this event is definitely the Global Pet Expo Academy. Which offers free educational seminars on the latest trends and best practices for building and growing a pet business. Expert presenters from the industry will cover a broad range of topics, from marketing to feline nutrition myths. This is a talk I sat in on by Candace D'Agnolo of Pet Boss Nation. A coaching and consulting community bringing profits to pet businesses and excellent speaker to catch at almost any pet industry show. My personal favorite type of seminar to attend are the retailer panels. This year, Pet Business hosted two separate retailer panels. All winners of their Retailer Excellence Award both past and present. 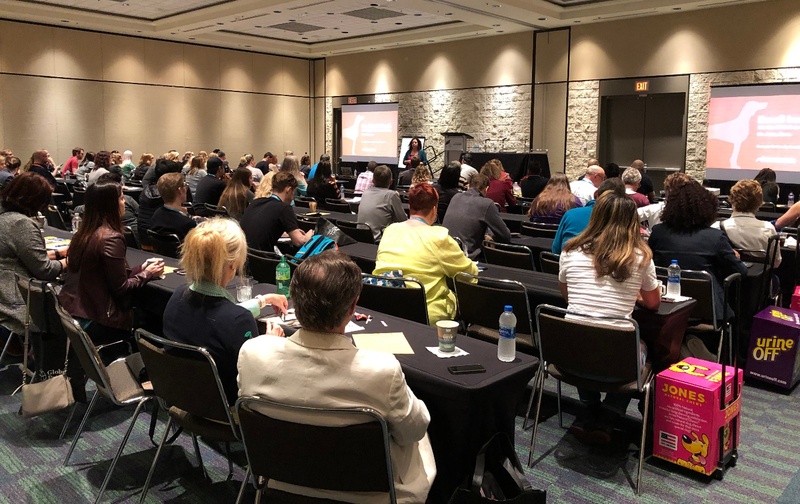 The purpose of these panels is for retailers who have been very successful in their pet business to share their experiences, their secrets to success, the importance of brand and customer loyalty and also field questions from the audience. It's truly one of the most valuable ways you can spend your time at Global. I learn something new every time I attend. 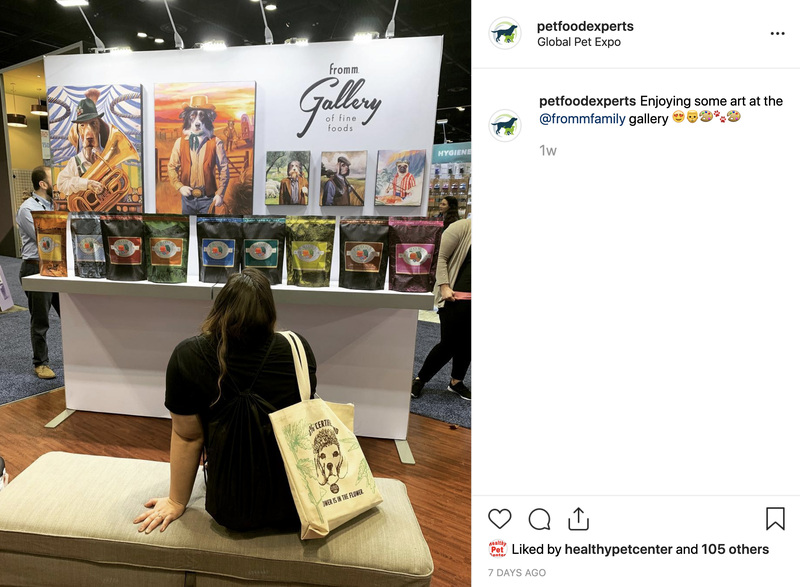 This post could really go on and on with all there is to see at a show like Global Pet Expo, and besides, if I talked about everything right now, what would we write about next year? My hope is that we were able to highlight just some of the best parts for you. Although there is value in attending any industry show, most notably SuperZoo in Las Vegas and our very own regional PFEXPO events. Global really stands by its claim that it is the 'The One Show to Attend' growing every year in terms of size, attendance and success. Were you at this year's Global Pet Expo? What was your favorite part, and what did you take away? Leave a comment below and start the conversation. Stacy joined the Pet Food Experts team back in 2008 as their first full-time marketing employee and has been working in the pet industry for over 11 years. 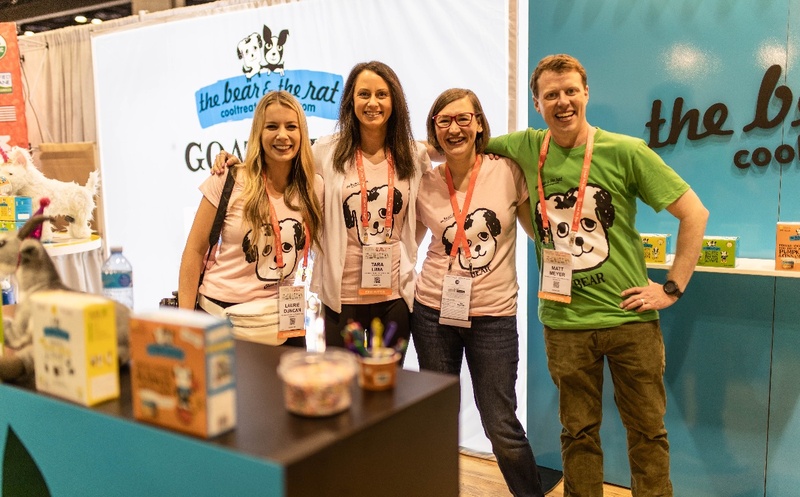 You can often find her nerding out over the latest in marketing technology, and looking for ways it can empower independent pet retailers everywhere through marketing. She currently lives on a large property in rural Massachusetts with her family where you can find her taking a hike in the woods with her rescue dog (and often pet product tester) Ripley, or in her garden flexing her green thumb.